Just what do those stickers with a red L, N or R on them mean when the show up on Irish cars? When you spot the letter signs it means that you have come across a L-driver, a N-driver, or a R-driver. When driving through Ireland, you will see cars marked with special "plates" (which are really large stickers or printed signs) - called L-plates, N-plates, or R-plates. These are a warning to you that the drivers with these plates should not quite be trusted to adhere to the usual best practices on the road. These colored letters mean that there is a new driver behind the steering wheel. Take them as a sign that the car in questions is handled by someone who may not yet be entirely competent yet, and you can expect the occasional erratic driving or even excruciating slow driving. But what is the real, legal purpose of these plates? In a nutshell, they identify new drivers to the world, while at the same time reminding the people manning those cars that their new restricted licences come with certain special rules. The so-called "learner drivers signs" are not hung there with pride by the new drivers, instead, those signs are required by law. Any driver not yet in possession of a full drivers license must prominently display an L-plate so that other drivers can easily see it. The L-plate should be attached to the vehicle or (in the case of motorcycles) on a yellow armband. This denotes to other road users that the driver is not fully licensed and still learning to drive. While new motorcycle riders can be on the road alone, people who are learning to drive in other vehicles must be accompanied by a fully licensed driver at all times (and certain additional rules apply, such as the fact that other newly qualified drivers don't qualify for this supervisory role). Whenever anyone else drives the car (let's say the parent of the person learning to drive), then the L-plate has to be taken off the vehicle. So if you see a solitary driver in a car marked with an L-plate, he or she is breaking the law one way or the other. There are quite a few other restrictions when it comes to new drivers in Ireland. For example, L-drivers are not allowed to drive on motorways. And in Northern Ireland, the general speed limit for vehicles displaying L-plates is 45 mph (72km/h). The latter is well below the normal traffic speed on most larger roads outside towns, so learner drivers tend to hold up traffic - the L-plate is there to excuse this and other drivers refrain from harassing or tailgating the learner driver. Keep your distance and keep calm. The L-plate is, indeed, mainly a sign for other drivers. A sign saying "expect slow, at times erratic, driving" as well as a warning sign that essentially asks "don't crowd me". But a learner driver sign is really saying "I'm so sorry, but I am still learning!" If you have a car marked with L-plates in front of you, keep more distance than usual and be prepared for some creative driving maneuvers. Be a good driver yourself and give that person room to breathe. Don't provoke anything by tailgating, flashing your lights and so on. A fairly recent driving rule now states that drivers who were granted their first license on or after August 1st, 2014, now have to display N-plates for a period of 2 years. These N-plates identify "novice drivers", who have shown enough talent to be awarded a license, but who are still on a steep learning curve. The plates were brought in because research has repeatedly shown that novice (e.g. new) drivers are most likely to be killed while driving during the first two years after passing their test. This is simply due to inexperience, and the accidents result from this lack of practical experience. Related research proves that one in any five newly qualified drivers will crash in the first six months after passing their test. Luckily, minor fender-benders are the main kind of accident recorded. A driver generally is considered to be "inexperienced" until he or she has driven a whopping 100,000 kilometers, or over 60,000 miles (which, if you are only driving locally, might take a decade or more). The N-plate is there to identify novice status mainly to other drivers so that they can be considerate when approaching these newer Irish drivers. In contrast to learner drivers, there is no requirement for novice drivers to have an accompanying driver with them to supervise. But a novice driver may not act as an accompanying driver for someone who holds a learner permit (so no L- and N-plates on one vehicle, ever). 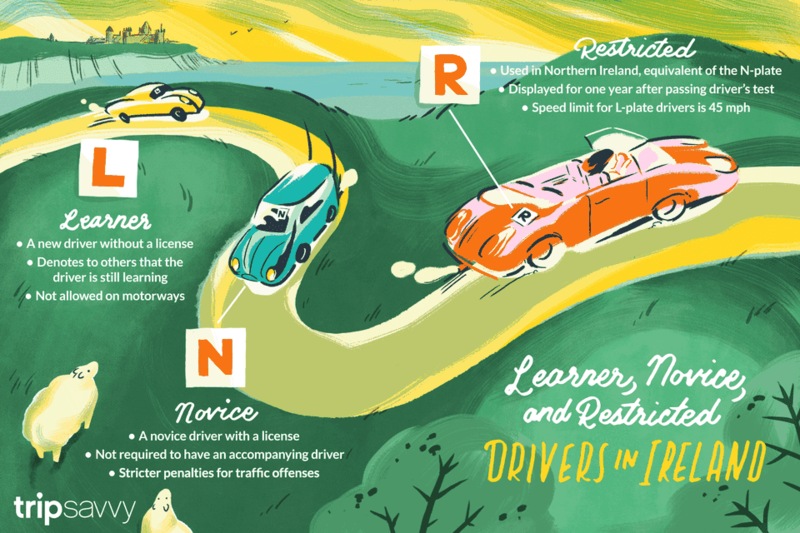 N drivers do need to be especially careful when driving because they face stricter penalties when it comes to traffic offenses. Specifically, it only takes a lowered threshold of seven penalty points before their novice license can be revoked. The R-plate has been in use for many years in Northern Ireland and is, basically, the equivalent of the new N-plate in the Republic of Ireland. There are moves under way to streamline the road traffic acts of both jurisdictions, under these the R-plate would be phased out and replaced by the N-plate. Until this comes to pass, the R-plate is still in use and mandatory after passing the driving test for a motor car or a motorcycle, they must be displayed for a period of one year from the date of passing the test. Again, this is mainly a means to identify an inexperienced driver to other drivers. There is, however, one major difference to N-plates: the maximum permitted speed for any vehicle displaying R-plates is 45 mph (72km/h), whether or not the vehicle is being driven by a restricted driver (plates should only be on the vehicle if it is driven by a restricted driver anyway). So, as in the case of a Northern Irish learner driver, the restricted driver is never allowed to go fast. Up until fairly recently, the licensing system in the Republic of Ireland was considered to be one of the worst in Europe. Basically, because it did not work well and, at its extremes, it seemed to reward drivers for failing the test. In the old days, you could apply for a driver's license once you were of a certain age and had access to a motorized vehicle. With these two requirements, and for a small fee, you then approached a local testing office and took your Irish driver's license test. If you passed, you were handed a driver license. If you failed, you were handed a provisional driver license. In other words, either way, you were given a license! The only difference being that the provisional license only lasted so long, so you had to re-attempt the driving test a few years later. And if you failed again ... they handed you another provisional license. And so on, and so forth. Rather than an issue of public safety, the problem really became one of paperwork. The Irish government realized that the practice of handing out provisional licenses also produced more and more attempts at getting a full license, in turn creating a backlog of test appointments, and slowing everything down in the licensing office. The solution was to grant "amnesty" and grandfather in all of these temporary license holders. All drivers who had repeatedly proven (by failing a test) that they were not fit to drive were granted a full license. Backlog cleared. What could go wrong? Finally, after a sweeping reform, Ireland instituted mandatory driving lessons (not just a driving test) for new drivers in April 2011. As a Tourist, Should I Use a Learner Driver Sign? No ... it has for some time been a "clever idea" by visitors to Ireland to plop a L-plate on their vehicles while driving around on their vacation. The reasoning being that since tourists are not used to driving on the left, they are also basically learning how to drive in Ireland. The hope is that this sign will also serve as a warning to other drivers. But it does not work that way. L-, N- and R-plates are legal requirements, and also have certain conditions imposed upon them, meaning the drivers are restricted in many ways. We mentioned that L-plate drivers cannot use motorways and that they have to abide by speed restrictions. As a tourist, you can't have it both ways - expecting other drivers to look out for your well-being, then passing them doing 120 km/h on the motorway. So no, it is not a clever idea to use learner drivers signs on vacation in Ireland, and it might actually get you on the wrong side of the law. Which means - don't do it. For more information on driving in Ireland from an official point of view, visit the National Driver License Service (Republic of Ireland), the Road Safety Authority (Republic of Ireland), or the government information website on Motoring in Northern Ireland. The Automobile Association Roadwatch Website (Traffic News) and the AA Routeplanner are also valuable resources for planning any trip in Ireland. Just What Did "The Celtic Tiger" Mean?